Nearly 3.2 million North Carolina adults (18+) were unmarried in 2014, representing 3% of the 107 million unmarried adults nationwide. In both the United States and North Carolina, never married individuals comprise the majority of unmarried adults—63%. 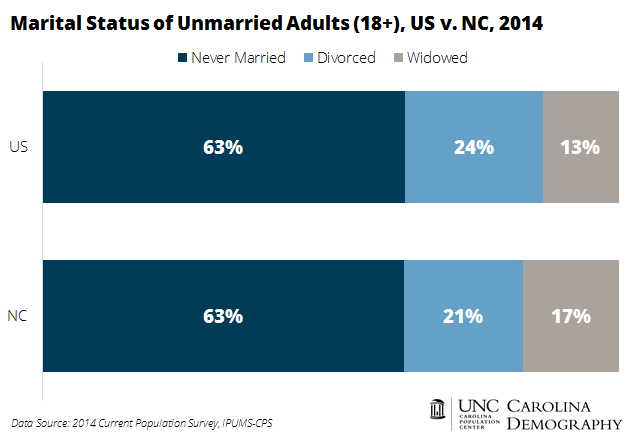 Nationwide, a higher share of unmarried adults report being divorced (24%) than in North Carolina (21%). In North Carolina, it is more common for unmarried adults to be widowed (17% vs. 13% nationwide). Among unmarried adults, there are significant age differences across marital status. Never married or single individuals are much younger. Never married North Carolina adults are, on average, 31.5 years of age, similar to the average age of unmarried adults nationwide (31.6). In contrast, the average age of currently unmarried, divorced adults is 53.4 in North Carolina and 53 nationwide. Unmarried adults who report being widowed are even older: on average these individuals are 71 years old in North Carolina and 72 years nationally. This entry was posted in Carolina Demographics and tagged adults, age, Current Population Survey, marital status, marriage, unmarried. Bookmark the permalink.